PhoneClean is a self-explanatory macOS application that provides the required tools to clean your iPhone or iPad and improve its performance. With PhoneClean’s help, you can effortlessly clean up and optimize your iOS device without worrying about damaging installed apps. On top of that, you can check for privacy threats and eliminate over 30 types of junk files. From PhoneClean’s main window you can check the status of your mobile device, view the occupied and free space, perform a quick or deep clean, access the toolbox list and restore a backup. The Quick Clean feature is capable to rapidly remove most known junk files in the shortest time span possible. On the other hand, the Deep Clean function is capable to perform a complete iOS scan and check for privacy threats. The first cleaning method helps you remove app cache and temp files, cookies, crash logs, photo cashes and iTunes radio history while the Deep Clean allows you to remove the call and FaceTime history, as well as browsing history, iOS notifications, messages, cookies and caches, kill all active apps and remove orphaned files. Thanks to PhoneClean’s advanced tools you can clean, repair and tune up your iOS device by removing duplicate files, repairing damaged media, uninstalling unneeded apps and more. Users with jailbroken devices will be happy to know that PhoneClean allows them to clean their device’s operating system and shrink various app. 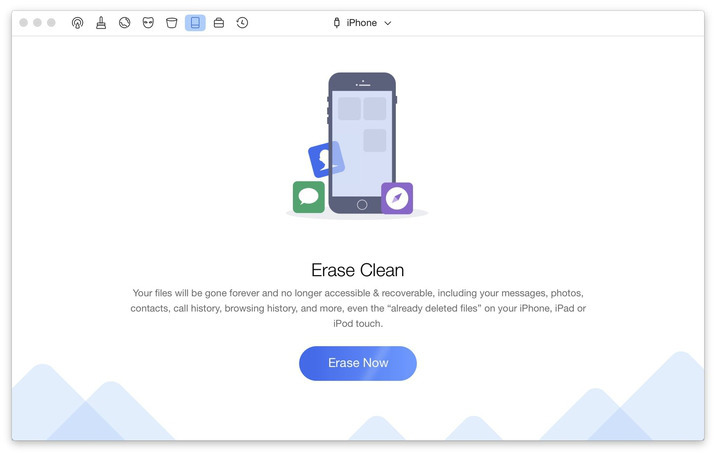 What is more, PhoneClean helps you create full backups before cleaning the device, so you can still recover data that you accidentally removed during the cleaning process.